The Range Rover 4.0 SE and 4.6 HSE are the more expensive models in Land Rover showrooms. They are built in England by Rover, which is owned by BMW but maintains a separate model range and identity. Range Rover was the first of the luxury sport utility vehicles in the United States when it arrived in 1987, offering a blend of opulence and off-road capability that caught the attention of well-heeled buyers. Rover's success stateside with luxury 4 x 4s encouraged several imitators, and the list continues to grow. Aromatic leather upholstery and attractive wood trim greet occupants in the roomy interior, which holds five people. Side-impact airbags, as well as the required front airbags, protect front-seat occupants. Interior amenities include a standard sound system that is a 300-watt Alpine unit with 12 speakers and a six-disc CD changer, and the 10-way, power-controlled driver-seat adjustment. 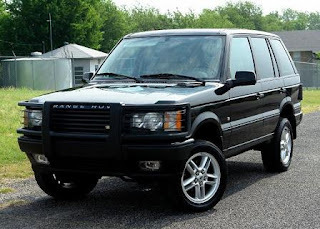 Range Rover has a body-on-frame design with body panels made of weight-saving aluminum alloy or zinc-coated steel and a ladder-type steel frame. The rear window swings up and the tailgate drops down, and the spare tire is secluded below the vehicle. SE models come with 16-inch tires and HSE models ride 18-inchers. The SE uses a 188-horsepower, 4.0-liter V-8, and the HSE has a 222-horsepower, 4.6-liter V-8. Both come with a four-speed automatic transmission and permanently engaged 4WD that splits power among the wheels as needed for best traction. The 4WD system also has a low range for crawling up and down mountains, and four-wheel traction control. A standard air suspension automatically lowers the vehicle for easier driver entry and exit and adjusts ride height to suit vehicle speed and driving conditions. Only the Hummer exceeds Range Rover's off-road capabilities, but most buyers in the luxury end of the SUV market aren't interested in bouncing over rocks in the wilderness. The arrival of several competitors, with more on the way, has pushed the Range Rover out of the limelight. It remains a rare breed that is equally at home at the Rubicon Trail or at the Ritz.